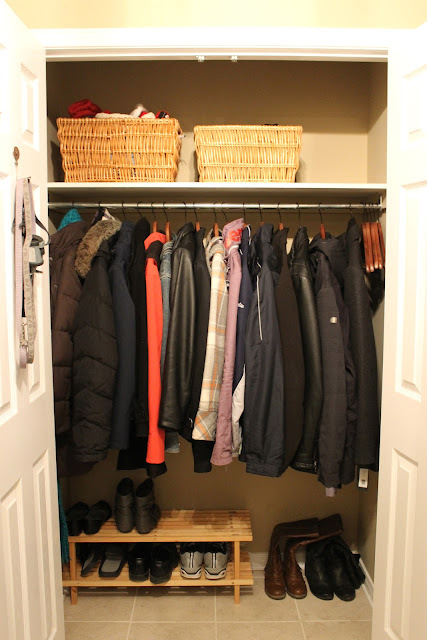 KM Decor: Organize It: Front Closet! Welcome to Part 4 of my "Organize It" week! So far, I've organized the kitchen fridge, laundry room, and bathroom cabinets. Today, I'm tackling the front closet. Now, I'm going to be honest here, my front hall closet isn't a huge problem in my home. But, I know that for others, especially those with little ones, the collection of coats, shoes, boots, backpacks, and outdoor accessories can just about drive anyone nuts! For us in my home, the inside of the front hall closet normally has a mountain of shoes and boots in it. And this typically drives me nuts! 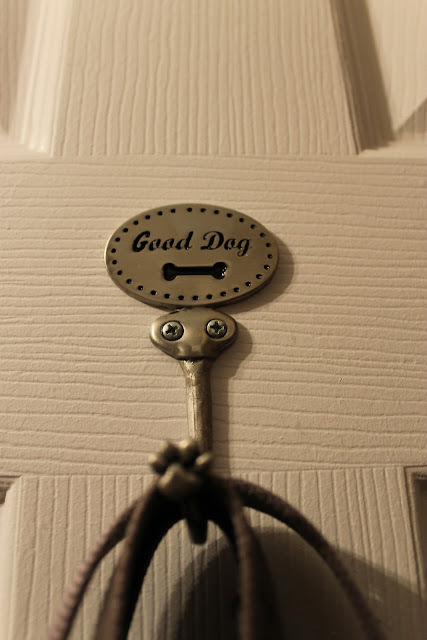 Inside the closet door, I've installed a metal hook specifically for my dog's leash. This way it won't sit on the floor of the closet, or go missing elsewhere in the house. Boots, shoes, and sandals can easily end up in a pile in the front closet. And noone wants to go searching for the shoe mate when you are trying to get out the door. So, a simple wood rack from IKEA and extra space for boots leaves ample storage space for all your footwear. It's also a good idea to keep your current and usual footwear in the front closet, and your extra shoes in another spot in the house (I keep all my other shoes in my walk-in closet, which you can read more about here). Above the coats, I have two different size wicker baskets that hold outer accessories and other necessities. 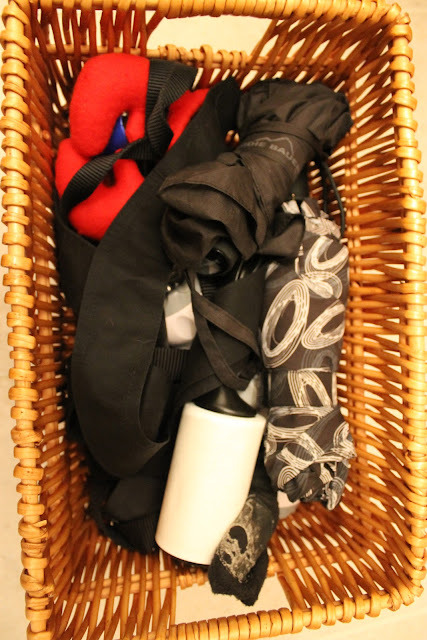 The smaller basket holds necessities such as umbrellas, flashlights, and a lint remover. These go-to items can easily get misplaced around the house, and are almost always the thing you are looking for as you are heading out the door for the day. 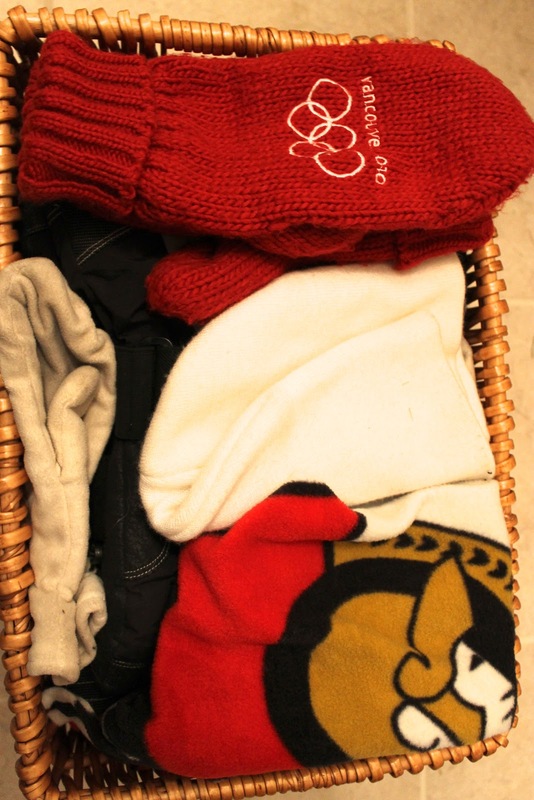 In the larger of the two baskets, you'll find all outerwear accessories such as winter hats (or toques to my fellow Canadians), mitts (such as my Vancouver 2010 Olympic mitts), and scarves (like my hubby's fleece Ottawa Senators scarf - boo NHL lockout!). 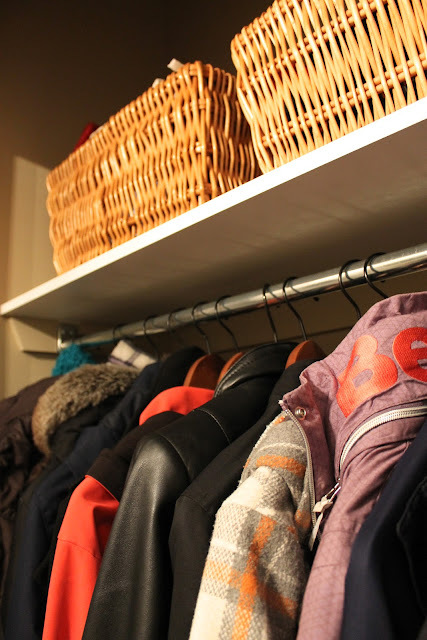 How have you organized your front hall closet? Do you switch it out based on the season, or do you keep everything the same year round? Tune in tomorrow for the final part of Organize It week where we'll look at the linen closet.